Sculpture (Murtikala) is one of Nepal’s most outstanding art forms, of ancient pedigree and yet vibrant and diverse in the present. “Nepalese sculpture is a conservative tradition, with slight changes in proportion or decorative details appearing over hundreds of years. Stylistically, Nepalese sculpture grew out of the art of Gupta India, and later was influenced by that of Pala India. However, Nepalese artists created a distinctive style of their own …” read more. 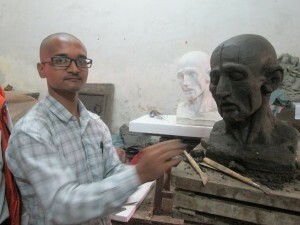 The Sculpture School of the internationally renowned Lalit Kala Arts Campus (Tribhuvan University, Kathmandu) is a particularly important focal point for the nation’s most promising sculptors (a student of the campus is shown in the image above), and is home to contemporary Nepali sculptors, such as Professor Laya Mainali who tour internationally.